Boston Beats Dallas: The Boston Celtics came away with a victory against the Dallas Mavericks last night in nail-biting double overtime fashion. The C’s beat the Mavs 117-115 at the Garden, thanks in part to a pair of Courtney Lee free throws in the game’s final seconds. Lee’s made free-throws sealed the deal for Boston. Had Lee missed both of them, Dallas guard OJ Mayo’s 24 foot 3-pointer at the buzzer would have tied the game and forced a 3rd OT. Instead Mayo’s heroics were too little too late and behind Paul Pierce’s 34 points, 6 rebounds, and 4 steals the Celtics managed to sweat out a win. Rajon Rondo also turned in a top performance for Boston with a double-double of 16 points and 15 assists. Rondo was a rebound shy of pulling off a triple double with 9 rebounds in the game. Dallas’ top performers: OJ Mayo led the Mavericks in scoring with 24 points to go along with 6 rebounds, 3 assists and 2 steals. 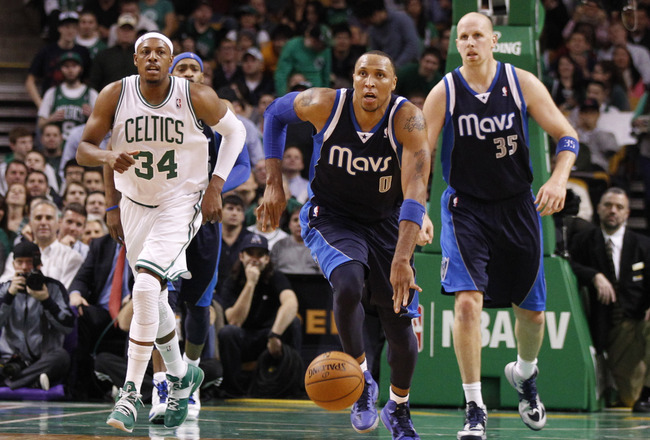 Shawn Marion also performed well with 16 points, 11 rebounds, 7 assists and 2 blocks. Fun Facts From the Game:With a score in the games first overtime, C’s forward Paul Pierce surpassed 23,000 points for his career. Pierce becomes only the 25th player in NBA history to reach 23,000 points. Also, six Celtics players scored in double figures in this one. Pierce 34pts, Rondo 16pts, Kevin Garnett 16pts, Jeff Green 15pts, Jason Terry 10pts, and Chris Wilcox 10pts. Back to Back Wins for Boston:With the win over Dallas, the Celtics are now the winners of two straight games. Boston will look to build off this win, and improve on their 12 and 9 overall record, as they hit the road to face Jeremy Lin, James Harden, and the Houston Rockets this Friday at 8pm from the Toyota Center. This entry was posted in Celtics and tagged boston celtics, Chris Wilcox, Dallas Mavericks, Houston Rockets, James Harden, Jason Terry, jeff green, Jeremy Lin, kevin garnett, OJ Mayo, paul pierce, rajon rondo, Shawn Marion, TD Garden by tsmithbsb29. Bookmark the permalink.